Not all students park an ambulance in their garage. But not all are first responders, either, with a headquarters located in the heart of the student neighborhood. 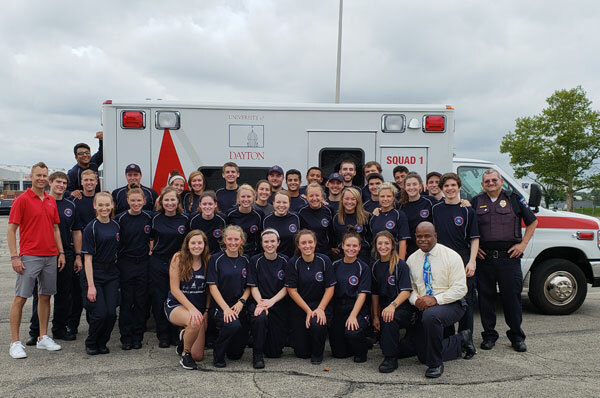 The more than 60 undergraduate students who make up the nationally recognized University of Dayton Emergency Medical Services (UD EMS) are heroes in my book for their 24-7 selfless service to the campus for the benefit of their classmates as well as faculty, staff, and visitors. Last year, they quietly logged more than 13,000 volunteer hours, answering calls that ranged from rolled ankles and brain injuries to seizures, cardiac incidents, and traumatic accidents. In fact, their quick thinking and professional training saved the life of a staff member who went into sudden cardiac arrest. That effort from the squad, which included two pre-med and one exercise science major that day, garnered UD EMS one of the four national awards they earned this year from the National Collegiate Emergency Medical Service Foundation — the most for any unit — at the annual conference in February. Karen and I recently invited the UD EMS students over for dinner to celebrate their accomplishments, thank them for their selfless service, and to hear more about why they volunteer to be on the front line at all hours of the day and night. Their work is the definition of commitment. The students arrived in identical blue pullovers, embroidered on one side of the chest with the UD EMS logo and on the other with their last names. Over a casual dinner of fajitas, rice, salad, and churros, they impressed us with their passion, their camaraderie — and their unquestioned dedication. “I see it as a great way to serve my fellow students,” said Matthew Bugada, a bio-chemistry major, echoing the views of many in the room. Every year, 200 students compete for approximately 20 positions. All undergo rigorous classroom and practical training to earn their EMS certification. And once they’re part of UD EMS, the training continues with seminars at local hospitals. Many are going into health care professions, but certainly not all. We met EMS students with a range of majors, including education, engineering, computer science, and psychology. They’re not paid, and the services they offer are free. They take turns working shifts out of a house at 214 Lawnview Avenue that includes offices, bedrooms, a kitchen, radios linked to the public safety dispatcher, and an ambulance stocked with medical supplies. Knowing that these certified EMTs are available around the clock to provide pre-hospital care and transportation for all medical and trauma emergencies on campus during the academic year helps put my mind at ease. I’m in awe of the extraordinary, brave work they do routinely, without fanfare. Indeed, they are unsung heroes.